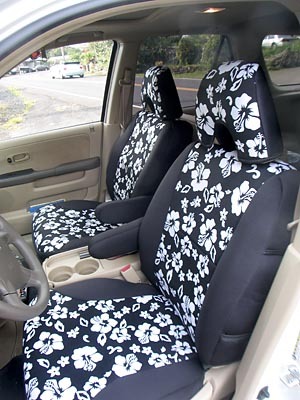 Okay, I gotta admit that I got the idea from Andi’s blog and her Wet Okole seat covers. I thought that’s a good idea as I have a moonroof and I just know I’m gonna stand on the front seats to shoot photos out the sunroof. Plus having something to protect the seats if I’ve gone to the beach, out in the rain or sooty from covering a brushfire. So here are the front seats done in my CR-V, still have to finish the back seats. I know there are cheaper seat covers but they’re made out of non-waterproof fabric and more importantly they’ll cover up the side airbags from deploying from the seats. Not a good idea during an accident. But seeing as how expensive Wet Okole’s are I found a similar seat cover made by Cover King. They claim to be better than Wet Okole covers but it might be just a Pepsi Challenge type of thing. But by ordering through Costco’s website I saved about $100 over buying the Wet Okole covers. So I thought I did pretty well, until I found this ad in the J.C. Whitney catalog online. It would have probably cost me only 1/2 of what I paid and even had a free car cover. It pays to do some research before shopping. The CR-V is about done now. Got seat covers on, windows tinted, foam pads on the crossbars for the roof rack and the cargo basket figured out for the roof. About time for some kayaking and adventure. *Okay, I checked the JC Whitney website and those covers are only for Jeeps. I don’t feel so bad anymore. Nice! Perhaps I should get a set…I just had one of my seats replaced under some warranty work (a bar came loose and stabbed me in the back.). Anyway, I'd like to keep the seats looking new. Perhaps there is a purchase in my future? Go through the Costco store online (I really wish they could ship to Costco here to save on shipping charges but it comes straight from Cover King). You can choose a variety of colors. Because my car's interior is what Honda calls Ivory I decided not to go with any drastic colors. I figured the flower pattern should hide the dirt and wear over the years. The Costco covers for the front seats were $165, had I gone through Wet Okole they would be $235. Back seat from Costco was also $165, via Wet Okole $259. A savings of $164. But I would guess that you could just drop by Wet Okole in Honolulu and pick them up to avoid the shipping charges. Beware in that ordering the seat covers through Costco is very, very weird. You can pick your covers but they never show-up in the shopping cart itemized for your specific car since picking the custom cover is done via a pop-up page from the Cover King website. I had to email Cover King separately to make sure they got the order right. You may have gotten the idea for this post from my blog, but your headline is more clever than mine. The seats look great. I thought about Cover King before I bought my Wet Okoles, but I had never seen Cover Kings, so I decided to stick with a brand I was familiar with. And I had a 10% off coupon and did not pay shipping because I bought them through McKenna Motors, so that helped. Thanks for the Costco tip. I ordered myself a pair of CoverKing neoprene seat covers for my Camry. I'll let you know how they turn out. Were you able to find the hibiscus patten on the costco site? I am looking at some for my miata and I don't see that pattern available. I haven't been to the Costco site recently, the CoverKing page re-directed me to the CoverKing website, that's where I found the flower pattern.